Pedestrian accidents are always serious. Almost all of these accidents result in serious injuries to the pedestrian. Sadly, any of these car accidents result in death for the unprotected pedestrian. 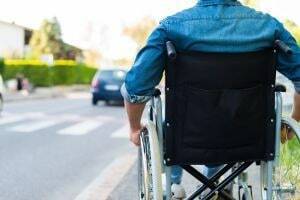 A new study, however, shows that people who are in a wheelchair and are involved in an accident with a vehicle are more likely to suffer catastrophic injuries or death as a result. A group of researchers from the University of Washington gathered data over a six year period to evaluate pedestrian related accidents. What they discovered is that during this six year period is that there were 81,000 accidents in the United States involving a vehicle and a pedestrian. Of those 81,000 events, 5,000 accidents resulted in the death of the pedestrian. What was even more alarming than this high rate of deaths is the fact that nearly 40 percent of those deaths occurred in people using wheelchairs. Of these deaths, men had a rate of three times that of women for being involved in a fatal accident. Additional statistics from this study show that half of all the accidents that occurred with someone who was disabled happened at an intersection within the crosswalks. Only 18 percent occurred where no crosswalks were available. Nearly 78 percent of all accidents show that the driver of the vehicle did not react in a manner to avoid the accident. This is an alarming statistic which shows that disabled people may not be seen as well when crossing a road as people who are walking or on bicycles. This also indicates that drivers do not know how to predict the actions of a person using one of these chairs so that they react accordingly. Between 2002 and 2013, one out of every 10 accidents involved a pedestrian. While this may seem like a very small figure, these same pedestrian accidents also represented 35 percent of all vehicular fatalities in California. A majority of these accidents occurred in high density areas of downtown Los Angeles and Hollywood. These are areas where there is a large majority of people walking at all times of the day and night. Many of these accidents included people who were disabled. While California is working aggressively to make intersections more pedestrian friendly, drivers and pedestrians alike are encouraged to use extreme caution at crosswalks so that they can avoid accidents. Data from the National Highway Traffic Safety Administration (NHTSA) shows that there are several things that contribute to wheelchair related accidents. Failure of the driver to see the pedestrian in the chair as they are crossing the road. The sitting position places them lower in the sights of the driver, making it harder to see them in the crosswalks. Failure of the driver to anticipate the actions of the disabled person. There is no real data showing why this occurs, but many accident reports contain the statement that the driver didn’t know what the person was going to do when they were at the intersection. About 18 percent of these events occur outside of crosswalk areas, signifying that crossing the road in areas outside of a traffic signal is very dangerous for disabled people. There is no significant difference between manual and electric chairs in the statistics. Any car accident involving a pedestrian is going to be serious. The pedestrian does not have the same protections as the driver of the car, and the sheer force and size of the vehicle is going to cause significant damage to the body. When you add in the factors that a person who is disabled is in a sitting position, the impact of the car will be different to their body than that of someone standing. Since many of these accidents involve the pedestrian being thrown a distance from the impact, the disabled person in a metal chair also has to contend with the injuries that will be sustained from the chair itself during the impact. Overall, people who are confined to a chair for transportation often sustain catastrophic injuries or many of their injuries result in their untimely death, when they are involved in a car accident. This makes it important to contact an attorney in the event of such a catastrophe to determine if the party at fault is the motor vehicle operator and what can be done to compensate the victims or their family.